Second flower garden of Hibiya Park, however it is not much decorated with flowers but simply a large square lawn. 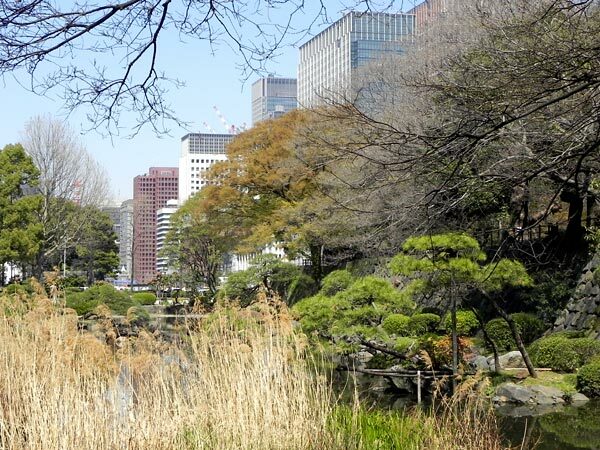 Hibiya Park is the oldest among parks in Japan constructed in Western style. It is also the most famous park of this kind in Japan, as it is located in the central part of Tokyo next to the imperial palace and Ginza and rich in historical reminiscences. Public parks were institutionalized in 1873 in Japan. Shortly after Tokyo was reborn as the capital of modern Japan, the government issued an order to designate five traditional tourist sites in Tokyo as public parks: Ueno, Shiba, Asakusa, Fukagawa and Asukayama. Second flower garden - in reality a large square lawn. Behind it is Hibiya Kokaido. About a decade later, leaders of the country came to think that they had to reconstruct and modernize Tokyo, so that it could among others impress foreigners and make them convinced that Japan was a civilized country and entitled to have the discriminatory treaties revised which the Tokugawa Shogunate had been forced to conclude with the major colonial powers. An order was issued in 1888 to draft a concrete plan and execute it. Due to budgetary constraint, an ambitious plan was gradually curtailed. 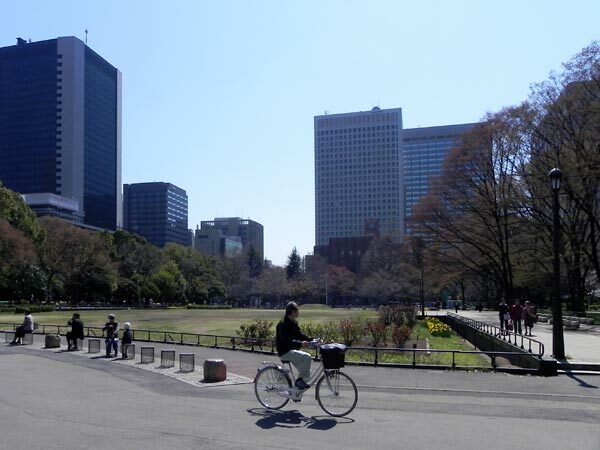 But, the idea of Hibiya Park survived and it was constructed with the master plan by Dr. Honda Seiroku (1866-1952). There was a common understanding to build a Western style park. However, people did not have a concrete idea how a Western style park should look like. Dr. Honda used a park plan of a German town Konitz (now Chojnice in Poland) as the model for his plan, because he happened to find it in a book he bought during his stay in Germany as a student. However, he also picked up some Japanese elements in the plan such as the areas of two ponds, because a purely European style did not suit the mentality of the Japanese at the time. First flower garden - favorite place of young couples for date as well as employees from the nearby offices for lunch. 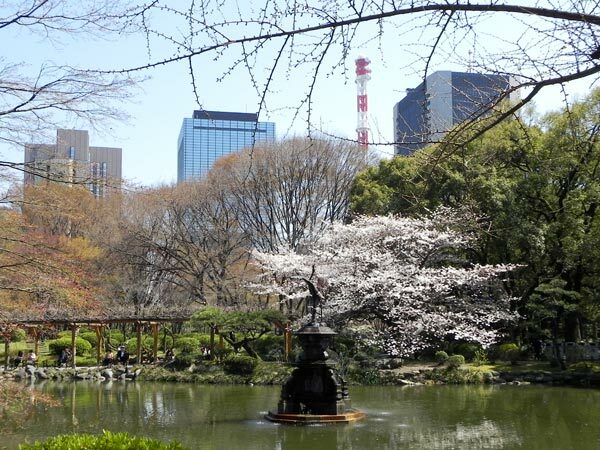 Hibiya Park opened in 1903 and keeps till now the original plan to a large extent. Entering through its main gate we can find a large fountain. A small open-air music hall exists on the right side and a large square shaped lawn on the left. The lawn replaced a sports ground when an underground car park was constructed in 1960, because shallow soil did not allow larger trees to grow on the ground. We can see a brick building beyond the loan. 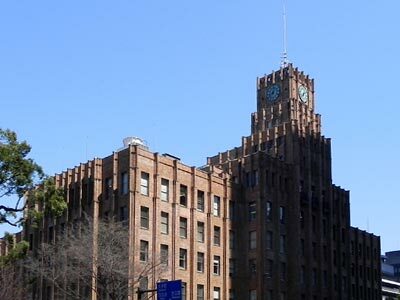 It is "Shisei Kaikan" (Tokyo Institute of Municipal Research) built in 1929 and a hall exists in its northern half. "Hibiya Kokaido" (Tokyo Metropolitan Hibiya Public Hall) was till 1960s virtually the only place where people could hear orchestra concert in Tokyo. Before WWII virtually all musicians who came to Japan including Chaliapin and Heifetz gave their concerts in Hibiya Kokaido. Even after WWII, Herbert von Karajan and Berliner Philharmoniker gave four concerts in Hibiya Kokaido during their first Japan tour in 1957. I also experienced my first orchestral concert here. It was the Beethoven Symphony No. 6 and performed by Yomiuri Symphony Orchestra. Nowadays, there are so many concert halls and Hibiya Kokaido is seldom used as concert hall. "Shinjiike" - using a part of old moat. Though it looks slightly wild, it is a paridase of dragon fly, beatle and other small animals. "Kumogataike" - a typical Japanese style pond which should be enjoyed by walking around it. Not only concerts but also lots of political meetings were held here. The assassination of Asanuma Inejiro (1898-1960), Chaiman of the Socialist Party, during his speech in Hibiya Kokaido in 1960 by a young rightest Yamaguchi Otoya is still remembered as a shocking affair in the aftermath of the huge anti Security Pact movements. Hibiya Park was used in many political events before WWII. It was for example the place for state funerals of famous politicians and generals such as Ito Hirobumi (1841-1909: First Japanese PM), Oyama Iwao (1842-1916: Marshall) and Okuma Shigenobu (1838-1922: Founder of Waseda University) before WWII. Hibiya Park was also often used for political gatherings after WWII. However, the age of political movements ended in the 1970s. The last victim of violent demonstrations was Matsumotoro, Western style restaurant in Hibiya Park. It was in 1971 when tens of thousands radical students gathered in Hibiya Park to start demonstration and were besieged by riot squads before leaving the Park. They became desperate and threw prepared bottles of Molotov cocktail to Matsumotoro which was then burnt down. When Matsumotoro reopened in September 1973, it wanted to express thanks to guests by organizing a "10 yen curry rice day" (about US 11 cents) every year on 25 September, the day of its reopening and the event continues till now. Matsumotoro is as old as the Park itself. Rich people could afford authentic French cuisine upstairs, while ordinary people enjoyed "yoshoku" (*) dishes such as "curry rice" at very reasonable price. Prominent people such as Sun Yat-sen (1866-1925), the founder of the Republic of China, used to eat at Matsumotoro while he was in refuge in Japan between 1913 and 1916. (*) "Yoshoku" literally means "Western meal". Diverse kinds of yoshoku dishes were invented in Japan in the process of introducing Western style cuisine and adapting it to the Japanese tongue. 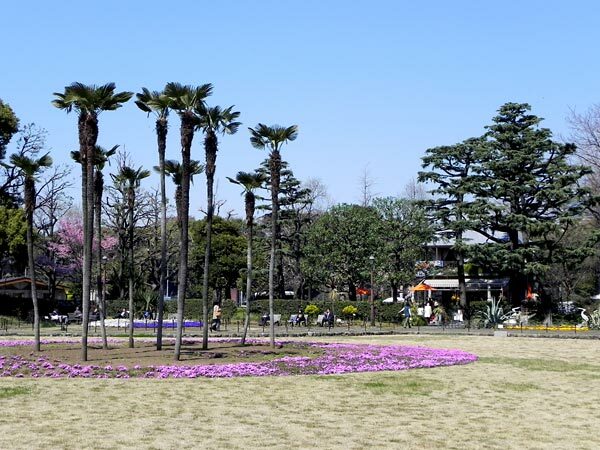 Hibiya Park was at the time of opening a gate to the exotic Western civilization for Japanese people; it offered exotic Western plants and flowers such as tulip and pansy in numerous flower beds, Western style music in open air concert halls and Western style dishes in Matsumotoro. This house was built in 1910 in a German bungalow style. It is now used by a company as a part of wedding party facility. 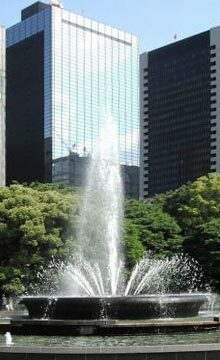 The most popular flower garden of Hibiya Park is in its north-eastern corner. However, Hibiya Park has also sections of Japanese style garden: among others Shinji-ike (Pond in the shape of the Chinese character "heart") and Kumogata-ike (Cloud shaped pond). Shinjigaike maintains the atmosphere of the old Edo period. Its stone wall is the rest of Hibiya-Mitsuke gate and the pond is a reminiscence of the moat which surrounded the palace. After the 1970s not much dramatic things happened in Hibiya Park. It is now a place which is incorporated into the life of businesspeople in the neighborhood. The Park offers routs for commuters. Many employees in the neighboring offices come here to take lunch. Some eat from their own lunchbox and others buy precooked lunchbox or use one of the 14 restaurants located in the Park. In the evening dust Hibiya Park is used by young couples for dates. 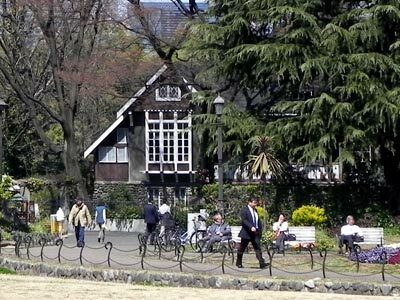 There are also more or less 30 homeless people who find lodgings in Hibiya Park. At the end of 2008 so-called "Toshikoshi-Haken-Mura" opened in Hibiya Park. This literally means "Village to enable (unemployed) temporary workers to enter a new year" and volunteers distributed warm meals to about 500 unemployed people including homeless. This project drew much attention and was followed up by the metropolitan government in the following year, but then too much problems occurred and the idea was then given up due to strong public criticism.